Epiphone’s guitars have always been a gateway into legendary models for those on a budget. 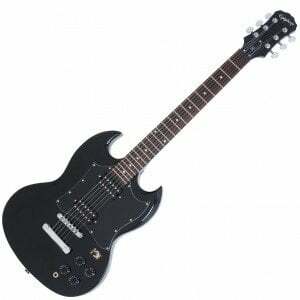 Epiphone SG-310 brings a whole lot of style at a reasonable price. Because of this and many more reasons, it belongs on our list of best guitars for those who are just starting out. Ever since 1961, Gibson’s SG was among the most popular guitar models on the market. 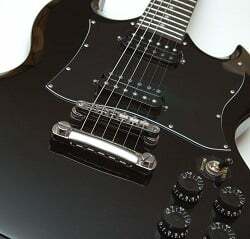 For that reason, they needed a version of this guitar which would bring the SG aesthetic to the budget user. Epiphone SG-310 is definitely not the first guitar built for this purpose, but it is one of the more popular ones. 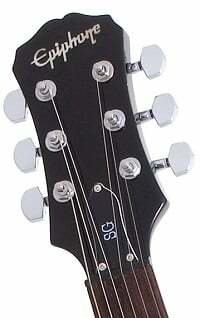 The body of this SG clone is made of alder and comes in several colors. The neck is a mahogany, Slim Taper D unit, that features a 24.75-inch scale. The rosewood fretboard is standard. In terms of fit and finish, everything is on point. The guitar feels very solid when you pick it up. Epiphone’s choice of pickups for SG-310 is spot on. We are talking about a pair of open-coil, AlNiCo packed humbuckers which work perfectly with the overall theme of this guitar. These are wired to a set of volume and tone knobs, as well as the pickup select switch. Everything is put together nicely and tightly, allowing for a very strong, consistent output. Humbuckers in question are Epiphone’s 650R and 700T. While they are not top of the line passive pups, they offer great performance to price ratio. Hooked to a set of 500k pots, you know that the power is always going to be there when you bring up the volume. One of the best things about Epiphone is their quality hardware. Even an entry level guitar such as this one comes with a set of hardware which not only does its job well, but also ensure great performance. The bridge is a standard LockTone Tune-o-Matic unit with a stop-bar tailpiece. While no one really expected anything amazing from this bridge, the level of sustain it offers is definitely above average. Tuning machines come in form of a rather standard die cast set, although they tend to be pretty solid when it comes down to retaining a tuning. Usually, the first thing people are upgrading on guitars in this price range is the tuners department. However, that is not really necessary with the SG-310. Even though we are talking about a relatively affordable guitar, Epiphone still managed to catch the essence of what SG is all about. The sound you get from Epiphone SG-310 is built for rock. Pickups have enough output to handle just about any kind of overdrive or distortion and not sound shallow. When you need some cleans, the guitar keeps up. Trebles are nice and crisp while the mids and lows sound pretty rich. For the most part, you can pull off just about any kind of sound with this thing, especially something blues oriented. Epiphone SG-310 is a perfect beginner guitar for those who want that classic, neutral tone. It’s built like a tank and it brings the type of performance that will keep up with you even when you grow up as a guitar player. For more info about the SG 310, click here. This is not just a perfect guitar for beginners but for everybody who likes to rock hard! I can tell. I’m a guitarplayer for 34 years.